Probably the most important key to providing top-notch customer support is empathy. What better way to empathize than to acknowledge and to accept responsibility when your customer has been let down? You guessed it: apologizing. Make sure to apply this empathy during the act of apologizing by showing that you really understand how and why this is affecting them. Validate and acknowledge that something is a real problem. Probably the worst example of an apology is “I’m sorry that you feel that way” or “I’m sorry that you think I’m not being clear.” Simply put, there is no “you” in apology. A far better way to phrase would be “I’m sorry WE caused this frustration,” or simply “I’m sorry for the trouble.” Take responsibility. Another way to show that you care is to thank them for using the product. In fact, I will often do this first – showing appreciation for not only the customer’s problem, but also for the person herself, might diffuse the negative feelings by mixing in some positive ones. The apology should invite a response, such as “let me know if you have any questions about what happened here” or perhaps “let me know if this was solved to your satisfaction, and if not, what more can we do?” This makes the customer feel involved and respected – and possibly even part of the solution – and assures him that we’ll here for him and are not going anywhere, even after it’s resolved. Lastly, a word on style. If you’re trying to humanize the interaction, then sound like a human! 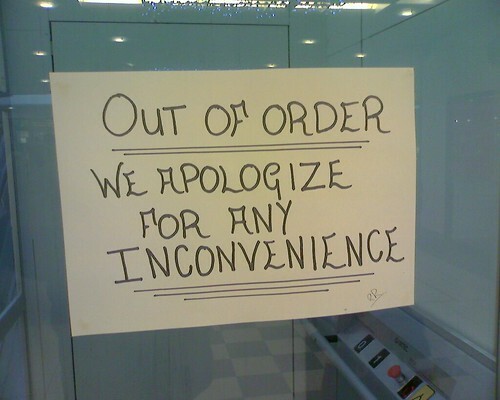 A cliched sentence like “sorry for the inconvenience” will likely just add fuel to the fire (forgive the cliche). Personalizing your response will go a long way towards establishing a connection. But avoid being too cute – you want to empathize, not trivialize. Follow most of these steps, and you might find that your relationship with your customer has actually strengthened as a result. We all make mistakes – maybe you will even look forward to the next problem, and see it as an opportunity to show how supportive you can be!